I was watching a Cardinals game the other day—can’t remember exactly which one—and after a few innings the only runs were off solo homers. I hate games like that. I don’t mind a few taters, but small ball is more fun. It got me wondering: How many games have all their runs knocked in by homers? And how many games have no home runs? I took a guess at both numbers. You have a guess. I’ll wait. At the half-way point of the ABL regular season, the Pythagorean winning percentages are listed below. (I used the 1.83 exponent used by Baseball Reference.) 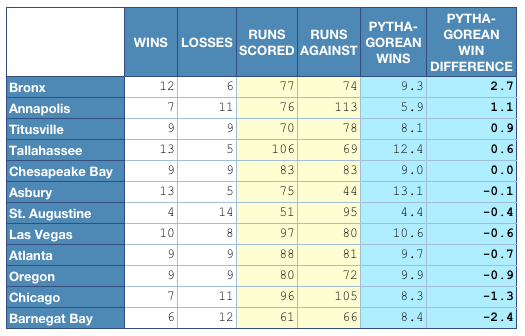 The results are sorted by Pythagorean wins, the number of wins expected based on the runs scored and runs against. The difference between the actual wins and the Pythagorean wins is a measure of how “lucky” a team was. 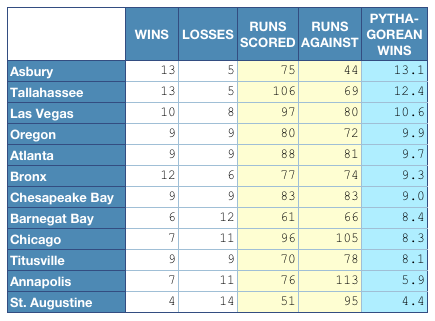 It indicates the teams that scored their runs in the situations that won games. And the teams that didn’t. Sorted by Pythagorean win difference, the table below shows the lucky teams at the top and the unlucky ones at the bottom. Can you steal 2nd base and before the batter swings, steal 3rd base? ANSWER: No. If the offense attempts a jump for a steal and fails or is successful, the offense must then swing away. The offense isn’t allowed to call a hit and run, bunt, pinch hit, pinch run, steal another base, or make any other moves until the next batter. The defense is also not allowed to make a move until the next batter. And, yet, consecutive steals of second & third do occur with the same batter at the plate. 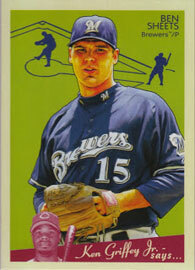 Questions: 1) How often does it happen in MLB, and 2) could that sequence of events be incorporated into ABL/TPB? Here’s the definition of the situation. A runner steals second, then, with the same batter at the plate, steals third or is caught stealing third. (I didn’t count straight pick-offs from second.) Per the Retrosheet event files, in 2007 that situation occured 40 times. There were a total of 2,542 steals of second, so the attempt for third occurred 1.6% of the time following a steal of second. The stat for the last five seasons taken together is also 1.6% (185/11,657). So, that answers question 1. Only about one time in every 60 does a runner who has stolen second attempt to steal third with the same batter at the plate. Does this occur often enough to incorporate into the ABL? I’d say… maybe. It could be added by requiring an extra roll in trying to get the jump to steal third. For example, after the defense is given a chance to set, the offense states that he wants to steal third immediately. If the extra roll allows it, he can try for the jump in the normal way. So, what should that extra roll be? Let’s assume that the runner would get a normal jump one-third of the time. 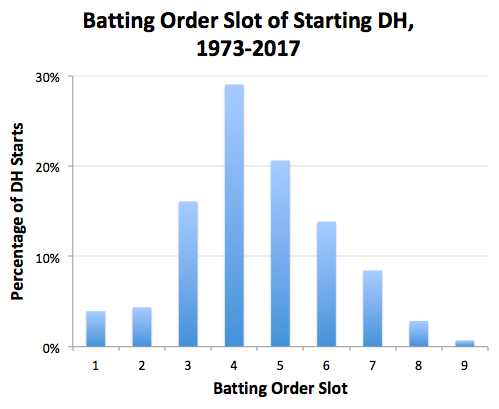 If the runner always tried to steal third immediately, that would indicate that a 1-in-20 extra roll would produce an attempt once every 60 opportunities, which would reproduce the MLB stats. However, managers will not always try this risky sequence. How often would they try if it were allowed? 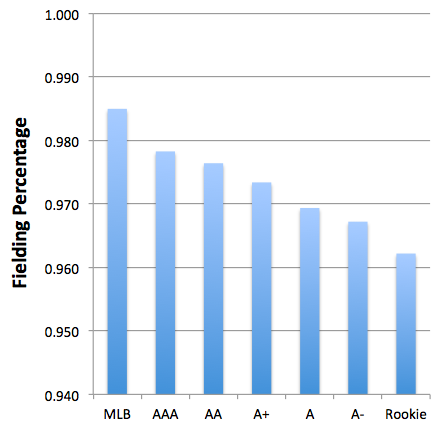 Stealing seems very lopsided in the ABL (a few players steal all the time, everyone else never steals), so I’ll say 50%. So, if the extra roll requires a zero be rolled with a ten-sided die in order to try for the jump, the percentage of attempts will be: 1/2 manager choice * 1/10 extra roll * 1/3 gets the jump = 1/60, which would reproduce the MLB stat. The SOM basic fielding chart seems to produce a lot of errors, at least compared to TPB. 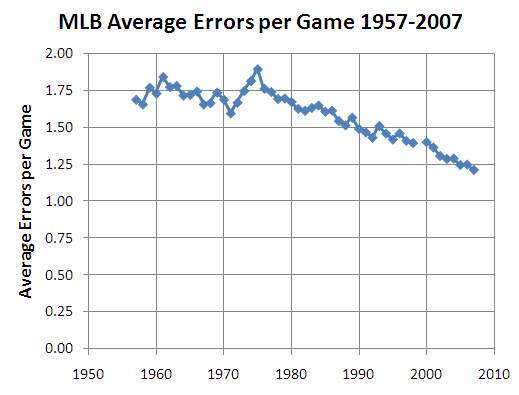 Reality check: what’s the average number of errors per game in MLB? A quick Retrosheet hack gives the average over the years. It’s not a perfect count—multiple errors during one play are all counted as one. Is the drop due to a change in fielding prowess or a change in official scoring? I reckon it’s the latter. More data from the Deep Engine. All results are based on ten million trials. As expected, no significant changes from 2006. I re-ran with the 12 2008 ABL parks, using the TPB 2007 data. Wow, there are some big parks in the 2008 ABL! It’s much harder to homer, especially for the light hitters who will find it almost twice as hard to hit them out in the ABL compared to the 30-park circuit. Now let’s see how the numbers look for the different hitting types. Again, this is ten million trials in the 2008 ABL parks. Not surprisingly, the pull hitters end up with more foul balls. In spite of that, they still end up with a greater probability of homering. This data can be combined with the batter’s power & the average deeps to estimate the number of home runs a batter will get with Deep! rolls against an average pitcher. Actually, the difference in home-run potential is so similar among the hitting types, that it’s not worth making a distinction. So, for example, a power-5 hitter will homer on about 40% of his 18.7 deep rolls against the average pitcher, effectively giving him an additional 7.5 home-run range. Combine this with the power distribution, and the probability of a home run on a Deep roll works out to 20.4%. That’s an important number for rating individual pitchers against the average batter. 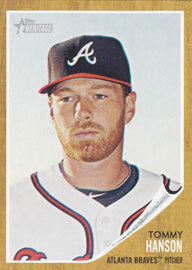 Another critical parameter: the average deep range on a pitcher’s card. 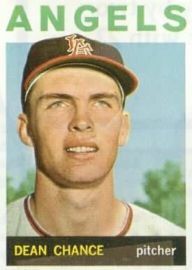 I looked at the 59 franchise pitchers and found an average of 18.7. (19.9 vs. L, 17.5 vs. R.) The largest range is found on Tom Gordon’s card, which has a 71 range, all vs. L.
The average is 3.31 (3.29 vs L, 3.32 vs R). These numbers are likely inflated, as the franchise hitters surely have more power compared to the entire field, but the franchise players will get most of the PAs. Another vital parameter: How often does a batter face a righty/lefty pitcher? 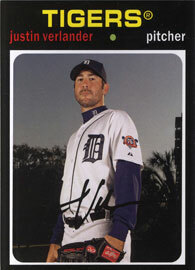 From the 2007 ABL stats: 78.3% of innings pitched were by right-handers, 21.7% of the IPs were from lefties. I had guessed it would have been about a third lefties. Another way to figure this is to figure the total splits for 2007 PAs at Baseball Reference. (NL, AL) Can figure the batting sides while we’re at it. The Bill James Handbook lists Range Factor, which is the number of Successful Chances (Putouts plus Assists) times nine divided by the number of Defensive Innings Played. Does this statistic correlate with the TPB range ratings? I picked a couple of the more important defensive positions and compared the 2007 Range Factors for starters with the TPB range ratings from the 2007 TPB Statistics Book. 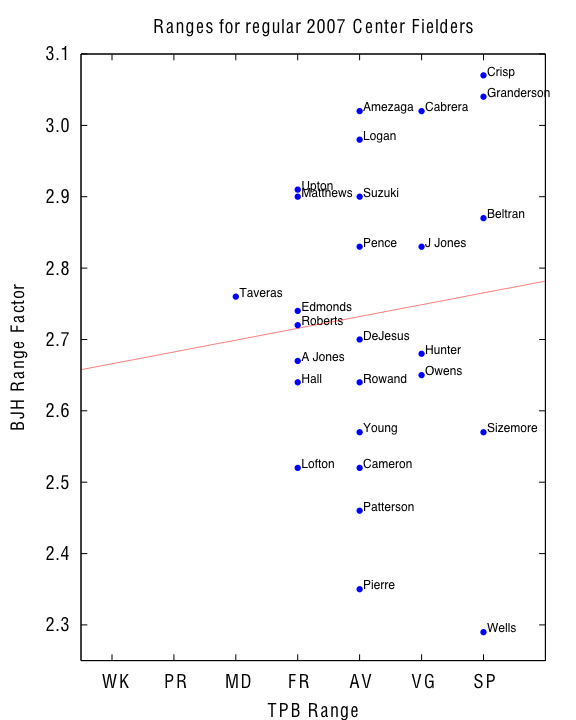 Graphs for shortstops and center fielders are below. 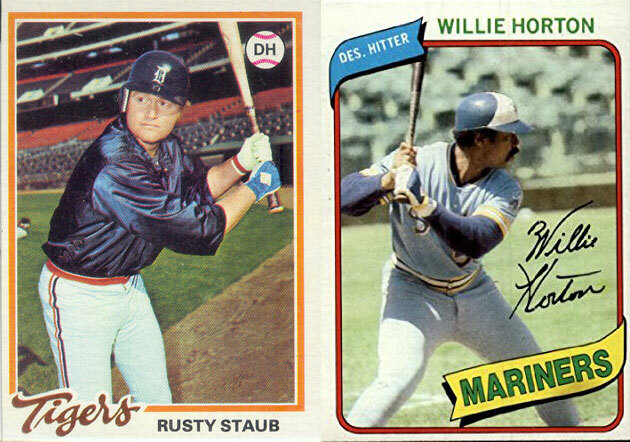 Shortstops show a bit of correlation. 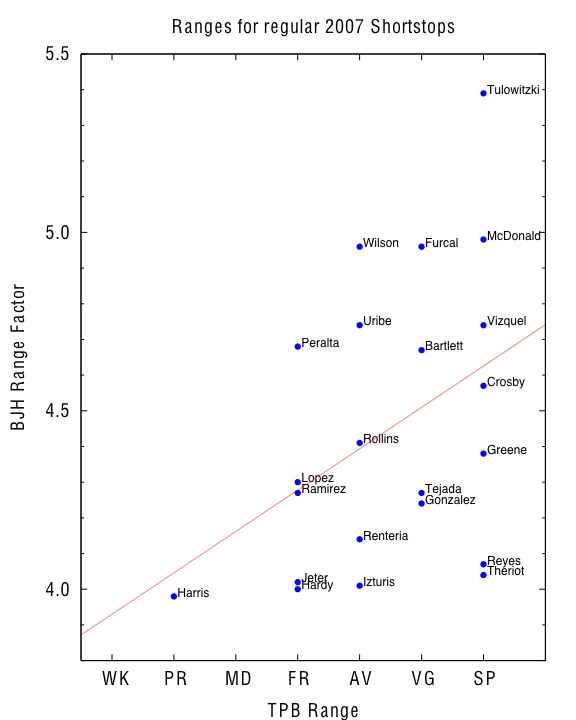 It’s no surprise to me that Furcal & Vizquel are highly rated by both measurements. I’m surprised to see that Reyes has such a low Range Factor. Center fielders are all over the place. Vernon Wells has a Superior TPB rating and the lowest Range Factor! The red lines are the linear fits to the data. The graphs assume that the TPB ratings are linear, that is, that the difference between VG & SP is the same as between PR & WK. Whether or not that’s the intent, it’s clear that there’s no strong correlation between the Range Factor and the TPB range rating. That could mean that either 1) the two measurements are meant for different purposes, or 2) one or both of the measurements are inaccurate. I don’t think #1 is likely. Surely each is trying to quantify the ability of a fielder to field balls that are hit in his general direction. Of course, measuring any kind of defensive ability is difficult. (See this discussion of various methods.) Whatever the case, it’s clear that the TPB ratings are not based on Range Factor. At the ABL Winter Meetings on the 16th I needed to select a team to bring into the league. Going in, I figured it would be between Boston & Philly. Here’s how I decided. Fifteen players can be selected, so I made up lists of nine position players (eight from each non-pitching position plus a “DH”), three starters, and three relievers. 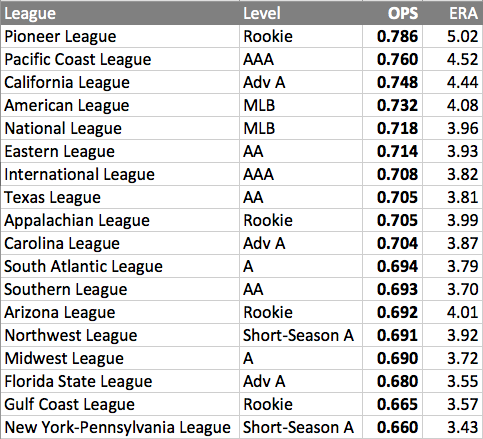 Minimum requirements for the ABL are 175 ABs (125 for catchers), 70 IPs for starters, and 30 IP for relievers. I used OPS+ to rate the hitters. For pitchers I started with WHIP, then added some arbitrary factors to get something that roughly mirrors OPS+, that is, higher is better and average is 100. I came up with (2.25-WHIP)*110. (It’s listed as “WHIP+” in the tables below.) 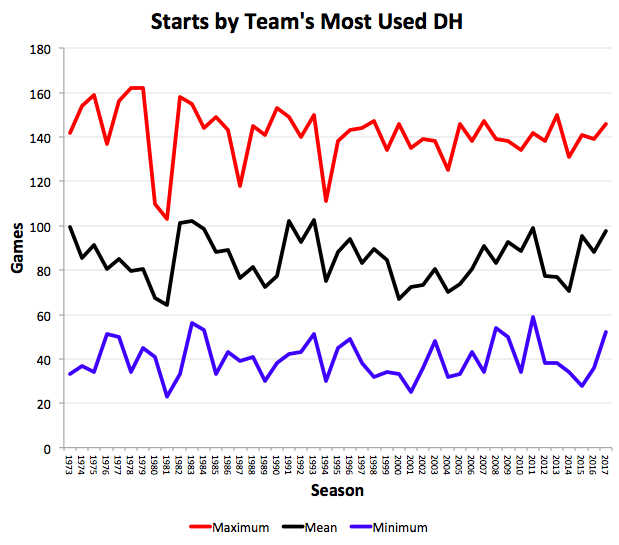 I weighted starters twice as much as relievers, based on innings pitched (six-inning starts). I then averaged the position players and pitchers separately to get team hitting and pitching ratings. The lists for Philly & Boston are shown below. Of course, you choose the wrong guys here, and the method suffers. Notably absent are Beckett & Schilling, who are already in the ABL. 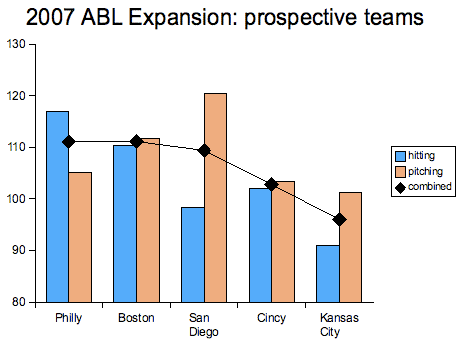 Philly has no one in the ABL. I did not consider fielding. In addition to Boston & Philly, I ran the numbers for a few other teams to see how they compared. The graph below shows the results. So Philly & Boston come out equal. That was no help at all! So the decision was down to hitting vs. pitching. I chose hitting. Also, Philly looks to have a very balanced lineup, and Utley & Rollins are a superior middle infield. 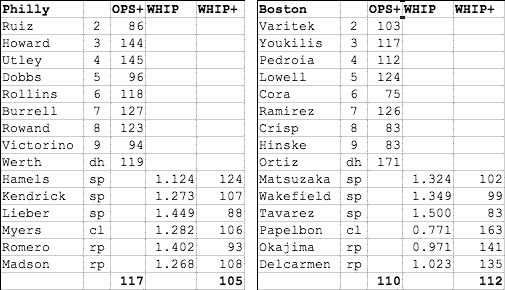 The biggest temtations of Boston were Papelbon & Okajima, both of whom have sick numbers. Big Papi & Ramirez are pretty good too! If the preference for people, places and things that share one of your initials is conscious, then it shouldn’t work if the thing you’re choosing is basically undesirable. Strikeouts are undesirable. Yet based on data from 1913 through 2006, for the 6,397 players with at least 100 plate appearances, “batters whose names began with K struck out at a higher rate (in 18.8% of their plate appearances) than the remaining batters (17.2%),” the researchers find. 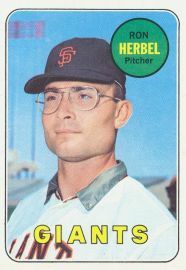 The reason, they suggest, is that players whose first or last name starts with K like their initial so much that “even Karl ‘Koley’ Kolseth would find a strikeout aversive, but he might find it a little less aversive than players who do not share his initials, and therefore he might avoid striking out less enthusiastically.” Granted, 18.8% vs. 17.2% is not a huge difference, but it was statistically significant—that is, not likely to be due to chance. If you survey enough sets of numbers you get random patterns that don’t always come out even. For example, the information about batters is really incomplete. It isn’t sufficient to just compare K against everybody else. Look at the entire alphabet and you will probably see variations of one or two percent between the letters. They won’t all come out the same. Does Q do better than F? Does C do better than M? If so, what does that really mean? Why aren’t they comparing S for strikeout? And what about the name of the pitcher? If it counts for the batter, why doesn’t it also count for the pitcher? This is not a question that can even be really addressed in isolation from everything else. Runner on first out at second or home. Baserunner hit by batted ball. The percentage I’m interested in is the number of times the runner is out at third divided by the number of times the runner is out or safe at third. Again, I counted all the years available in the Retrosheet event files. Graph below. The line is the least-mean-squares linear fit. I’m surprised how seldom the runner is out at third. There’s a clear downward trend, which indicates that runners and/or third base coaches have become more conservative. Perhaps stronger arms in the outfield are also a factor. Then you could sprinkle in some potential errors & such. Of course, there would be a dependency on where the single was hit (as there is now). 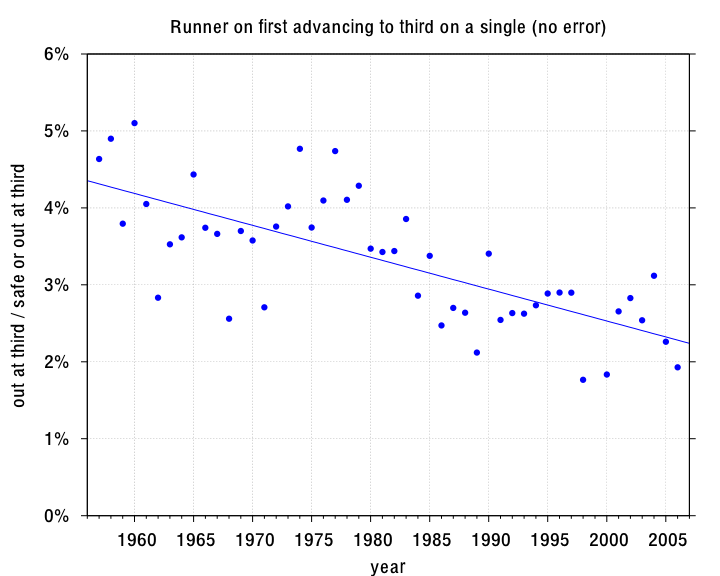 Previously I looked at the frequency of runners advancing from first to third on a single during the 2006 & 1973 seasons. 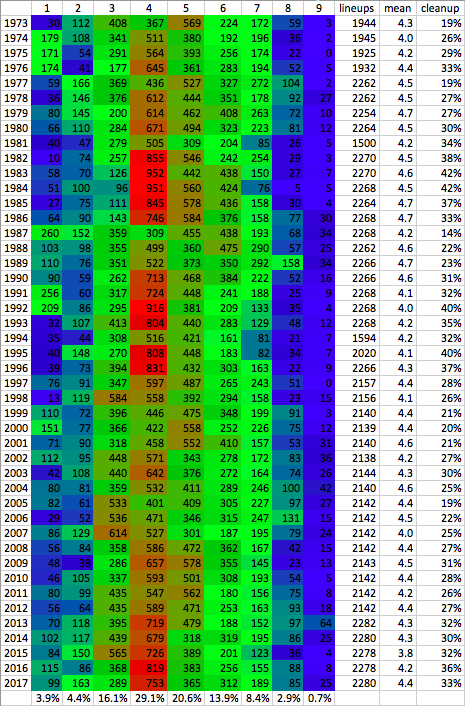 I extended the analysis by looking at all seasons available from Retrosheet (1957-1998, 2002-2006). A slight change: now I’m counting plays during which the batter went to second on the throw (error or not). 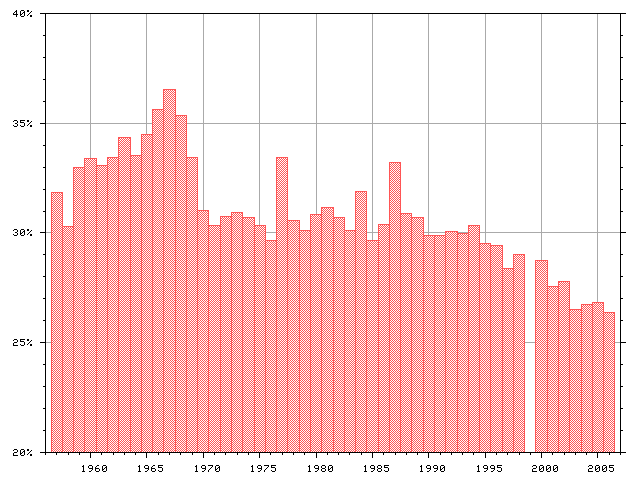 There’s a big spike during the late sixties, then it’s pretty constant from 1970-1995. Since 1995 there’s been a steady decline. Strange! Next: When runners try for third on a single, how often are they thrown out?